When I started blogging it came from an interest in reading blogs. At the time, I wanted to learn as much as I could about direct response marketing, online marketing and all kinds of things. Blogs were the best places to find that information. Sure, I still read trade journals and things like that, but blogs had the most up-to-date information and in some cases the best information available. There were CEO blogs, CMO blogs and blogs from everyone that worked in business. It was great. As I started getting interested in writing a blog of my own I started paying attention to the aspects of the blogs I liked. I wanted to emulate the things I liked while trying to improve on a few things. One of the aspects I liked was that every blog I seemed to enjoy had at least one image. So from then on I’ve tried to include images in posts. I feel it’s important. But early and even in recent months I’ve seen how important it is to name blog images correctly because if you get a little careless with images you can get some interesting search traffic. I’ve gone back and forth over the years with how to name blog images. For a while I thought it was best to name the image something that related to the content in the post. That way any search traffic that came as a result of the image would be the right kind of traffic. Then there was a time I figured it was best to name the photo for exactly what it was. 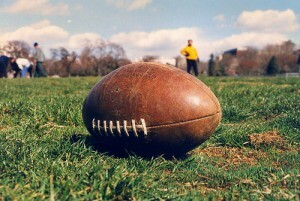 Case in point – The Old Football Post. That was a pretty good post. The reason I wrote it was because lots of people were interested in football and the NFL. I figured if I could combine the NFL and business blogging that it would be interesting to the regular readers at GBW and that a few NFL fans would find the post and also be of the right target market. The post did pretty well, but what I really started to notice was that I kept getting traffic to the post from Google Image search. And people were searching for images of old footballs. Since then Google has changed the way it does image search so blogs don’t get as much click through traffic from Google with images, but there is still traffic that comes to this post because of that image. The’s great, but the only bad thing is that this particular post doesn’t really convert visitors into clients. At the end of the day traffic is nice and usually if you’re doing blogging right you’re going to get the right kind of traffic, but sometimes you’ll get traffic that doesn’t really convert into clients. And for a business to work you need to be adding new clients to the roster. So at GBW we focus on doing the things that will bring in clients. That means getting the right kind of traffic to the site. Naming images “old football” and similar things might make sense on the surface, but we’ve learned that naming images closer to what the post is discussing is better for conversion. That’s the tip – name images the types of things that your target readers are searching for. It’s a balance of being relevant and getting the right traffic. And a bonus tip – be careful when you get spikes in traffic. Pay attention to what kind of traffic it is. If it’s the right kind of traffic then you have a post formula that could lead to something great. But if it’s the wrong kind of traffic you certainly don’t want to go after more of it.